On Friday February 9th, JROTC went to Mountaineer Food Bank to beat the record of 644 boxes packed in one shift. Located in Braxton County, Mountaineer Food Bank is the biggest food bank in West Virginia. The bank needs 2100 boxes a month to meet the demand and then distributes those boxes throughout 48 counties. To build, fill, and stack the boxes, JROTC organized their cadets in to five stations. The first station’s job was building the boxes. Three to five people at a time would work together to shape and tape the box. The second station’s job was to transport the boxes to the assembly line. At the end of the assembly line, the shift overseer checked every single box. The third station was the assembly line, and they just kept the boxes moving while filling them up. The fourth station stacked the boxes properly on the pallets. The last station’s job was cleanup. They would break down used boxes and pick up trash around the warehouse. 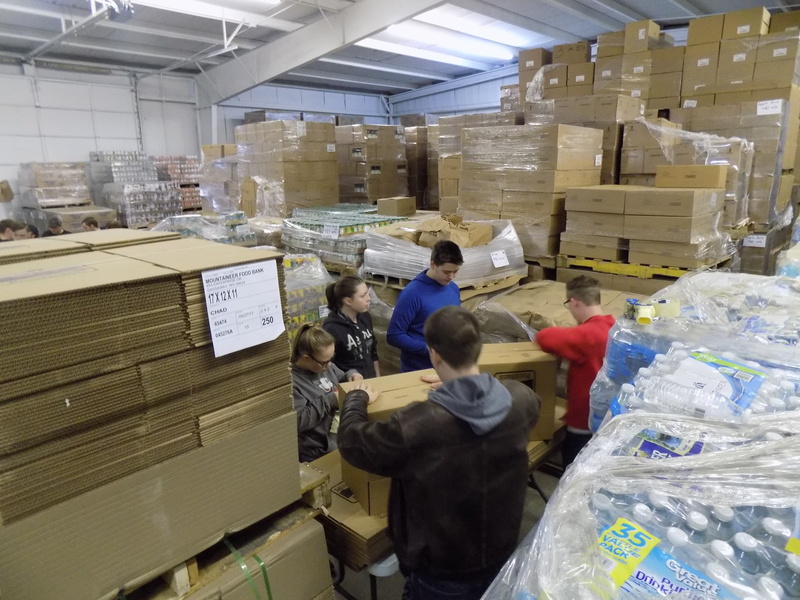 Forty boxes were stacked on each pallet and each box held enough food to fed 3-4 people. Each pallet held 40 boxes and each box feeds one family. The average pallet took 19 minutes to stack. To reach the goal, 17 pallets of boxes were needed to be completed. To stack the boxes, the stacking station (station 4) would make sure all of the shipping tags on the boxes were facing outwards, so the movers could know where to take the shipments. The trucks ship out on the third Thursday of every month. The JROTC cadets worked really well together and communicated clearly to get the job done. Everyone had a job and executed it flawlessly. They worked so hard, that they ended up crushing their goal in two and a half hours. They set the record to a high of 933 boxes stacked and filled. JROTC wants to continue helping this food bank on a monthly basis. The JROTC staff involved were Rylee Rogers, Jordan Overbaugh, Faith Lipscomb, Christopher Canteberry, James Ackinson, Isaiah Backes, Toby Boyles, Austin Lipscomb, Luke Pritt, Kane Raider, Jarred Freeman, Gabrielle Collins, Zachary Collins, Camden Crissinger, Maurice Vollmer, Jordan Wamsly, J.J. Lipscomb, Kaitlyn McClain, Alexandria Abarca, William Radcliff, Tammer Abdegelil, Kendal Johnson, Peyton Tompson, Dustin Skinner, Mya Stone, Matt Bryant, Matt Foster, Elijah Lanagan, Marshall Goins, Peyton Wilson, Richard Skinner, Zachary Spencer, and Gavin Tullier. A big thank you to JROTC, Sgt. 1st class Long, and 1st Sgt. Harvey for letting me and Caitlin Wyre come along to get a first-hand account of one of many of JROTC’s charitable endeavors.